RUGBY UNION: DAI Young admits Sunday’s match was a game of two halves after watching his Wasps side overcome rivals Leicester Tigers to move back on top of the Aviva Premiership table. With just under half-an-hour played Wasps were cruising in front of a bumper crowd of 27,930 after leading 19-0 thanks to tries from Christian Wade, Tommy Taylor and Dan Robson, two of which were converted by Jimmy Gopperth. But Young’s side ended a thrilling encounter relieved to have secure a 22-16 victory as the Tigers staged a credible comeback and almost turned the game on its head in the second period. Owen Williams put Leicester on the board with a 35-metre penalty and three minutes after the break he landed another to make it 19-6. Peter Betham was credited with Leicester’s first try of the match, which was converted by Freddie Burns and he added another three points to cut the deficit to just three points. And after surviving a wave of Leicester attacks Gopperth eased the pressure with another important penalty 13 minutes from time which proved to be the final points of the match. “It was the old cliché really, definitely a game of two halves,” said a relieved Young. “We were well on top during the first half, but we were clinging on a bit in the second half. “We had plenty of opportunities in the first half and created quick ball, which we know we can be devastating off. However, we also lacked a lot of composure and patience, because we could have put it out of sight in the first half. “We all know how proud a side Tigers are and if you give them any momentum, they’re going to come back at you. “At half time we talked about being disciplined and keeping hold of the ball and we did neither really. Leicester got their tales up and you were biting your nails towards the end. 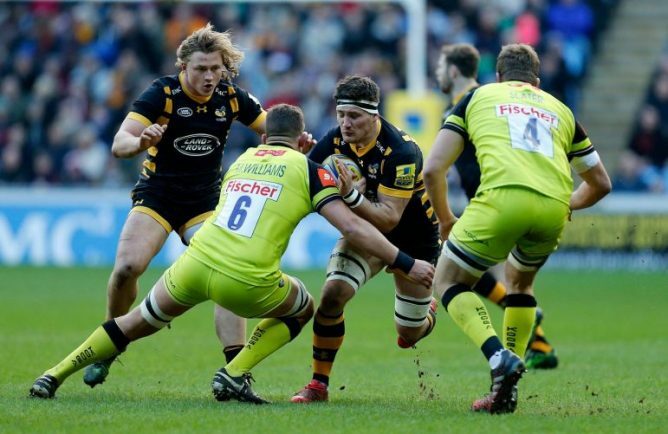 Wasps now turn their attention to the Champions Cup as they prepare to take on Toulouse, the most successful side in European history, at the Ricoh Arena in their fifth match in Pool 2. Young added: “It’s another massive game. It’s a cup final sort of game given how tight Pool 2 is, with three teams tied on points. It’s also a tight six-day turnaround for that one.